Define common ScriptCase application attributes. Application Code - Application Code assigned during application creation. Description - Used to describe application goals. Images Directory - The base directory where the application images are stored. 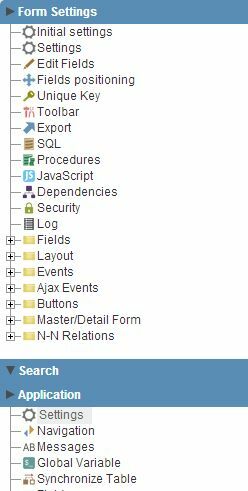 Documents Path - . The absolute path where the application documents are stored. ApplicationImages - Specific images used by this application. This option deploys the images called in event with the application. Choose an image uploaded to ScriptCase before. Remove the image in application. Folder - Folder where the application will be stored in the workspace. Edit Project - Allow other users of the group to edit the application. Timeout Message- Show a message after timeout limit. HelpCase Link - Associate a Help Manual to your application. Maximum file size - Set the upload maximum file size for image or document field. Error position on the field - DError position when criticizing a field. Show the Error Title in the Application - Show the title line of the error message in the application. Show the Error Title in the Field - Show the title line of the error messagem in the field. Error Title - Title message of the error. Script Error - Display script line and info where the error occurred. SQLError - Display SQL command that originated the error. Ajax Error output - Display Ajax events SQL and PHP output in a window.